Oooh, baby, we've been lovin' his ways and livin' with his music for over five decades. Peter Frampton is one-of-the-artists-to-beat in terms of live album sales and recognition for the iconic "Frampton Comes Alive!" album. He is reprising this monumental release, this time on the live stage, which he declared as his 'Farewell Tour'. 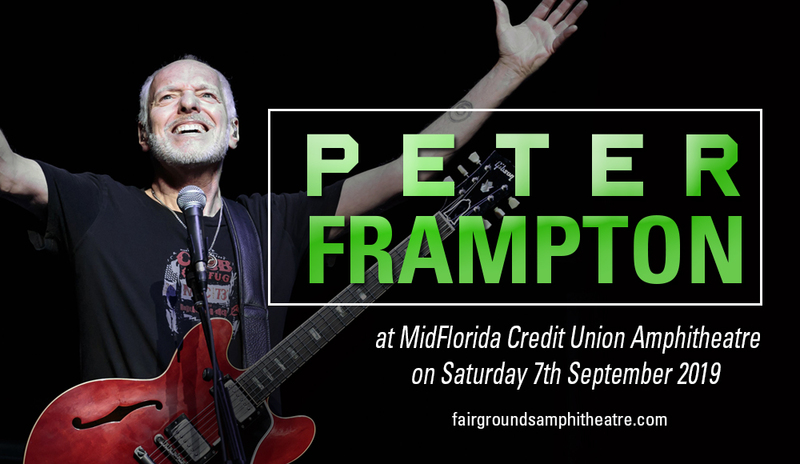 On Saturday, 7th September 2019, the MidFlorida Credit Union Amphitheatre will reverberate with the sights and sounds that celebrate the final milestone of a truly remarkable concert artist. Don't ever miss seeing this living legend in action, one last time. Waste no time in booking those tickets. Go, buy your tickets now! Peter Frampton openly declared his medical condition and has somewhat spoken with finality that this tour will be his last. “I’m going to be playing as long as I can play, but this will be the last extended tour. I can’t say what I’ll be doing next year,” says Frampton. With a career spanning 50 years, Frampton has made an indelible imprint with his breakthrough album Frampton Comes Alive!. The album has sold over 8 million copies in the United States alone, with a long string of hit singles. "Breaking All the Rules", "Show Me the Way", "Baby, I Love Your Way", "Do You Feel Like We Do", and "I'm in You", are just a few of the many songs that made Peter Frampton one of the most revered live acts in the industry. This tour, in particular, will still prove that Peter Frampton is still at the top of his game, but like all good things, it somehow would come to an end. Peter sees this as that point where he steps back and be grateful at all his trailblazing achievements. "I've been playing the guitar for 60 years. Started when I was eight and now I'm 68. So, I've had a very good run. ", he says. If you say you truly are a music fan, this concert should definitely be part of your bucket list. This is your chance to scratch that off, and be proud that you'll soon be part of the amazing 'Frampton Comes Alive' legacy.